Note to local miscreants: If you had plans to rob a house, you missed your chance Sunday. You should have been in Ireland. You had no idea, did you? We can guess you didn’t because most of the United States likely doesn’t realize the world’s third-largest global sporting event is going on right now. The Irish know, though. 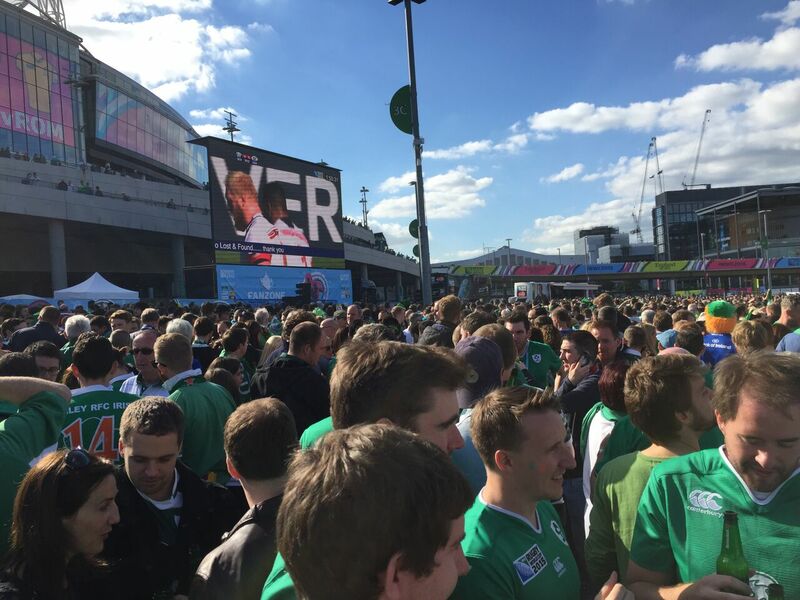 Some 89,267 fans packed London’s Wembley Stadium Sunday, and judging by their number of green shirts (and wigs, facepaint, and capes), 89,167 of the assembled throng were Irish. 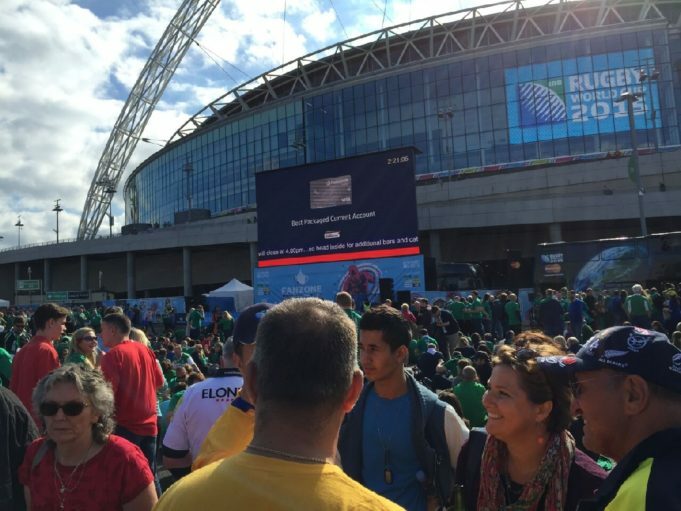 The entire country seemed to have emptied to come watch its national team, and set an attendance record for a Rugby World Cup game. And of those Irelanders who didn’t make it across the Irish Sea to see the match in person, you’d have to figure a significant portion of them watched the TV3 broadcast in pubs for the duration of the match. So that meant a lot of temporarily vacant housing ripe for burgling. Of course, even if you’d tuned in to see the match here in the States and noticed the green sea covering the stadium’s red seats, you wouldn’t have made it to the Emerald Isle in time to get into much trouble. 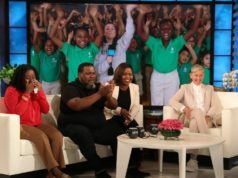 But you almost certainly didn’t watch it because it wasn’t one of the featured matches on official U.S. broadcasters Universal Sports Network and NBC Sports Network. Those outlets are carrying USA Rugby’s matches plus a handful of others (including the semis and final). You would have had to purchase the pay-per-view package with your ill-gotten gains. FYI, the USA’s chances to advance past pool play don’t look strong at this point. They’ve lost tough games to Samoa and Scotland (though they did lead the latter at halftime), and they’ve got match-ups ahead against Cinderella story Japan and one of the world’s best, South Africa. 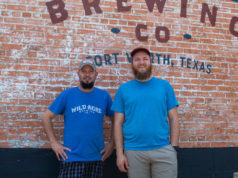 If you do fancy watching upcoming U.S. games at Upper 90 on College or another rugby-friendly sports bar, you’ll want to come armed with some knowledge. Firstly, know that the sport you’ll watch is called “rugby union.” It’s played with 15 players per side and is distinct from the rugby league code, which uses 13 men. The two sides split more than a hundred years ago over professionalism issues. The American football code broke off from rugby not long after that, fyi. Rule (or law, as they say in rugby) differences evolved over time. Rugby union, the most popular code in most of the world, finally went professional in the 1990s. New Zealand’s team, known as the All Blacks for the uniforms they wear, is the defending champion and the favorite to win in 2015. Australia, England, France, Ireland, South Africa, and Wales are also considered to have decent chances. New Zealand and some of the Pacific Island teams perform Haka rituals before the game. These are based on native dances and are an important part of rugby tradition. I won’t try to explain all the laws (rules) here, but just remember you can’t pass the ball backwards and you can tackle really hard as long as you come in low and wrap up your opponent. To score a try (similar to a football touchdown), you have to cross the tryline (aka goal line) and touch the ball to the ground. 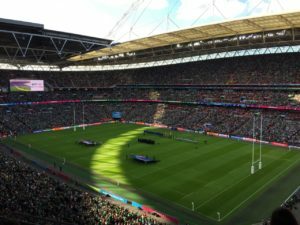 World Rugby (formerly known as the International Rugby Board), the sport’s global governing body, suggests that the Rugby World Cup ranks behind only the Olympics and soccer’s FIFA World Cup in worldwide impact. Teams representing six continents participate, with Canada, Argentina, and Uruguay joining the USA from the western hemisphere. England hosts the quadrennial event this year, with Wales also staging eight games (Japan gets it in 2019). Whether you’re into rugby or not, the whole spectacle of a huge sporting event feels cool to a sports fan. 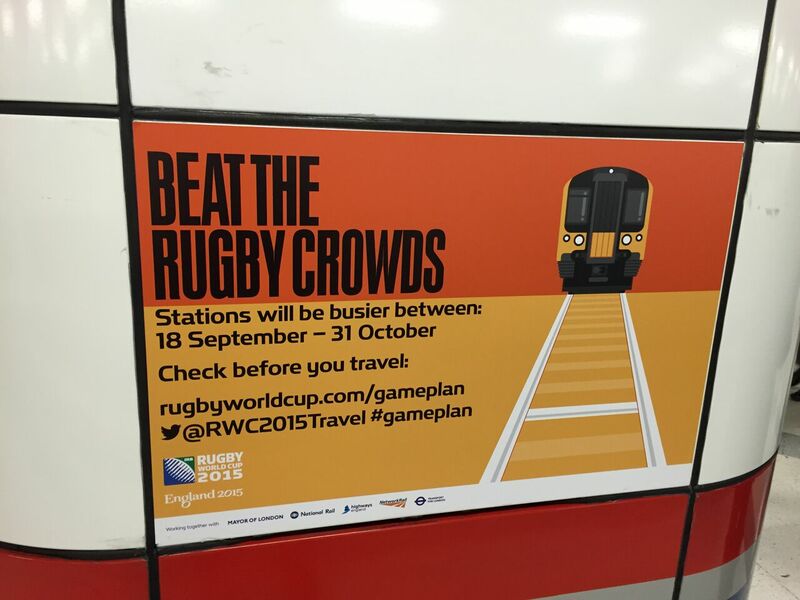 The RWC’s presence shows up throughout London. 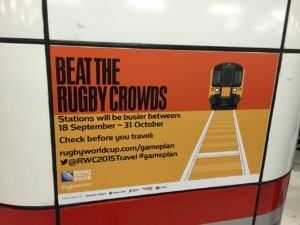 Notices remind you to factor in possible gameday delays when taking the train, advertising signs pass along official sponsor messages (and the occasional ambush ad), and people wearing rugby shirts from many countries wander the streets. 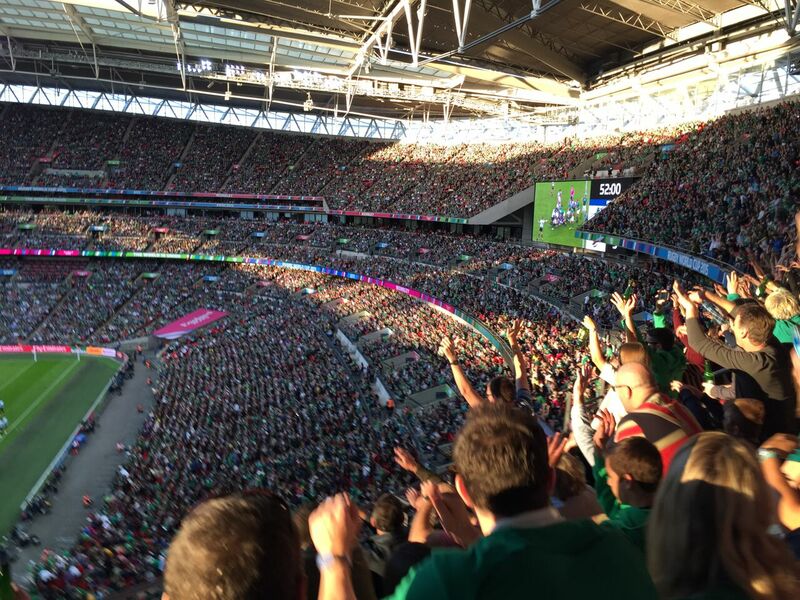 The game I attended (together with the whole of Ireland) came at Wembley Stadium. The facility serves as England’s national association football (soccer) stadium, but it has also have played host to a pair of RWC matches. Even though the crowd had only pockets of yellow-clad Romanian supporters, the game presentation stayed studiously down the middle, as it must during a neutral-site event. The P.A. 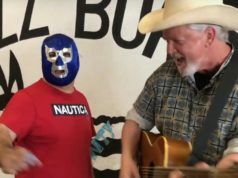 announcer’s energy level when announcing lineups and tries for both sides would have felt at home at a Mavs game. They play both national anthems before the match and have a large video board for replays. Late in the game, a wave (or Mexican wave, as the English call it) broke out. It started poorly, with different decks going in different directions, but eventually straightened itself out. A packed pregame fanfest offered a chance for attendees to mingle, drink Heineken (RWC official beer), try a few rugby-related games, and watch USA v Scotland on a big screen. At one point, one of the event’s on-screen messages directed Dermot Kelly, Michael Collins, and Padraig Pearse to the lost-and-found. It was either a prank, a joke, or a tradition and I never quite figured out which – the men mentioned are an actor and two Irish revolutionaries from the days when they fought the English presence on their home island. While we’re on the subject of revolutions, here’s another good reason for the American one. On a whim, we tried the nachos in the fanzone. Thank goodness for independence – you do not want the English controlling your nacho-making. Trust me. Once the game began, a strong Irish team coming off a win in the RBS 6 Nations tournament (an annual meeting of the national rugby teams of England, France, Ireland, Italy, Scotland, and Wales) crushed the Romanians. The Irish team now sits at the top of Pool D.
Criminals, take note, Ireland plays again on Saturday against Italy. If you’re taking a crowbar or wire cutters with you on the plane, be sure to put them in your checked luggage. For the rest of you, there’s a huge sporting event going on, to which you may want to pay attention. You might really enjoy the spectacle and the competition, even if you’ve planned nothing more nefarious than collapsing a scrum.